We are a leading Manufacturer of automatic hologram applicator and hologram applicator machine from Ahmedabad, India. We compete effectively in today's global business environment by constantly delivering cost competitive and high-quality Automatic Hologram Applicator that meets or exceed customers expectations. Our offered range is manufactured under the guidance of our qualified professionals using high-grade components and modernizes machinery in accordance with set industry standards. These applicators are widely demanded in the market for some of their striking features. Moreover, clients can avail the entire range from us at industry leading prices. Specially designed Hologram Applicator machine for applying Holograms on any type and shape of products. Can be easily accommodated with any existing machine or conveyor for online production. Any type of product such as bottles / corrugated box/ cartons/pouches etc can be used. We are offering Hologram Applicator Machine to our client. This unit can be used as Hologram applicator / Label applicator and it is fixed on existing packing line conveyors. The machine operates at the speed up to 400 Products/min. (depending upon product specification). Similarly, it can be used as a stand alone unit for labeling where products are firmly held on conveyor line. 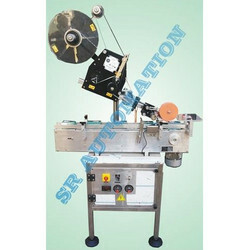 The hologram/labels pressing and folding device can separately fitted as per requirement. The hologram/labels can be folded in 'L' or 'U' shape with a special mechanism.